Cryolophosaurus was a carnivore (meat-eater) that lived in the Antarctic during the early Jurassic period, between about 196 and 190 million years ago. Fossils of Cryolophosaurus were found in rocky outcroppings near the Beardmore Glacier in Antarctica, which is 13,000 feet (4,000 meters) above sea-level, and today lies just 400 miles (650 kilometers) from the South pole. At the time it lived, Antarctica was slightly further North, and so its position at the time would perhaps have been around 1000 miles (1,650 kilometers) from the South pole. In any case, this find (along with a number of other fossils found nearby, which include other dinosaurs, a pterosaur, and a Tritylodon mammal-like reptile, as well as fossilized tree trunks), seems to provide support to the theory that the Jurassic period was much warmer than today, and the Antarctic had forests, even at high altitudes. Cryolophosaurus was about 20 to 26 feet (6 to 8 meters) long, and probably weighed around 1,100 pounds (500 kilograms). 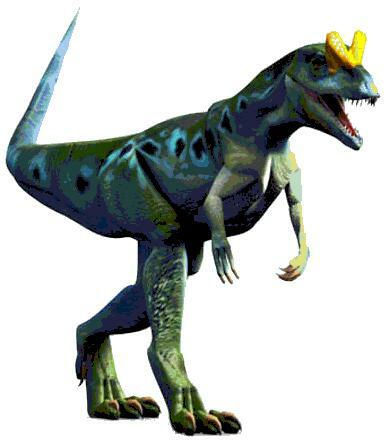 Like its relative, Dilophosaurus, Cryolophosaurus had a crest on its skull. The unusual nature of its crested, caused Cryolophosaurus to gain the nickname "Elvisaurus", based on its supposed resemblance to one of Elvis Presley's hairstyles. Antarctic Dinosaurs - Cryolophosaurus lived in Antarctica. Cryolophosaurus was a genus of dinosaur. "Cryolophosaurus" means "cold crested lizard". Cryolophosaurus was a member of the Saurischia ("lizard-hipped") order of dinosaurs. What this means, is that although Cryolophosaurus was not closely related to lizards, it did have similarly shaped pelvic bones. Cryolophosaurus was a Theropod - a member of a group of related bipedal dinosaurs that included the ancestors of birds (although Cryolophosaurus was not itself an ancestor of birds). Cryolophosaurus lived between about 196 million years ago and 1960 million years ago. Cryolophosaurus was a carnivore (meat-eater). Cryolophosaurus was usually about 20 feet to 26 feet (6 to 8 meters) long. Cryolophosaurus probably weighed about 1,100 pounds (500 kilograms). Allosaurus and its relatives were fierce and dangerous predators. Dinosaurs in this group had deadly claws and razor-sharp teeth. Bold, full-color illustrations, easy-to-read charts and maps, and interesting facts take readers back to a time when these fearsome hunters walked the earth. Imagine your own Jurassic time with Papo highly detailed dinosaurs. The wide range of dinosaurs will let children create their own adventures including the legendary T-Rex, the Velociraptor, the Pteranodon, the Triceratops and more. Papo is a reference in the world of figurines Thanks to the originality of its products and the extreme care taken with product quality and safety. In an age of mass consumption and throwaway goods, Papo remains true to its wish to produce fine toys that last over time and can be passed on from generation to generation. The range of products offers a wealth of 12 different universes ranging from animals made with astonishing degrees of realism to original characters from imaginary worlds. FUN FACTS: Cryolophosaurus is the first meat-eating dinosaur to be discovered on the frozen continent of Antarctica. Cryolophosaurus was a large theropod dinosaur, with a bizarre crest on its head. Due to the resemblance of this feature to Elvis Presley's haircut from the 1950s, this dinosaur was nicknamed "Elvisaurus". 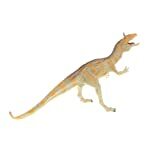 PRODUCT SPECS: Cryolophosaurus measures 5.3''L x 2.4''H. 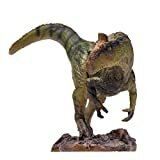 CollectA's replica of the Cryolophosaurus is lifelike down to the unusual crest on the front of its head. First described in 2012, this dinosaur lived in Antarctica during the Early Jurassic Period and grew to be about 23 feet long. At that time, the continent was further north and had a more temperate climate than it does today. Paleontologists believe the Cryolophosaurus, whose name means ''frozen crested lizard,'' was a carnivorous predator. This beautifully sculpted, collectible figure from our Prehistoric Life Collection measures 5.5''L x 3.5''H. Each prehistoric figure in our collection has been approved by archeologist Anthony Beeson, a well-respected expert in paleoimagery. All CollectA models are individually hand crafted to the highest standards and made with the finest and safest phthalate-free, lead-free materials. Create a natural world in miniature with high quality toy replicas from CollectA. Our mission is to educate collectors and to provide the greatest opportunity for creative play. SAFE & DURABILITY - Soft PVC material, heavy duty and drop-resistant.ASTM/EN71/CPSIA/CE approved. Non-toxic and soft, kids' safety always comes first. 1:20 HAND PAINT - Exact details make you feel the charm of Jurassic Period! Exquisite design and hand paint process, make it Historically realistic. PORTABLE SIZE & IDEAL GIFT - 11.5*4.8 (L*H)inch. Compact and portable, you can take it everywhere you want. Ideal gift for kids and dinosaur collectors. Want your kids to know more about dinosaur and to enjoy imaginative play? The Mosasaurus toy from Recur is really what you need. With it, you could spend a joyful time with your kids, telling them amazing stories of the past in earth. Recur seek to develop children's understanding of nature and life, "Quality, Safety, Love, Nature and Happiness" is our design idea. Recur now developed 4 series of more than 100 products: Dinosaurs, Wild Animals, Sea Animals and Farm Animals. 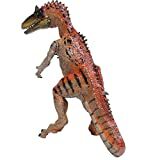 Amazing Action Figures for Dinosaur Toys! With it, you could spend a joyful time with your kids .Edutainment, maintain our kids curiosity and teach them through lively activities. Ideal for education on prehistoric species, environmental awareness, and natural history. Created for the dinosaur lover in us all, these replicas were designed to introduce the fascinating landscapes and creatures of the prehistoric world, feel the charm of Jurassic Period! If you have any problems, please feel free to contact us! Imagine hours of fun playing with realistic ancient animal designed especially for your unique collection. Attract your children's attention or play together with them to enhance parents-child relationship and have amazing gameplay experience. Are you ready for the adventure? Get your set Now! ☺Exercises imagination and creativity; helps kids, toddlers and teens to learn with pleasure while playing and having fun. ☺Enhances kid's hand-eye coordination, motor skills, shape and color recognition. ☺Bring new ideas and possibilities for playground, collections or display cases. ☺Great educational gift for boys and girls birthdays and party favors. 1. Contain small movable parts not suitable for children under 6 years of age. Cannot be eaten. 2. This model comes Without original box. please feel free to contact us anytime and we will be happy to help! The Cryolophosaurus dinosaurs is finally here! 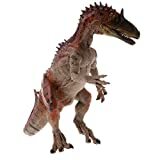 - surprise your child with a realistic action figure of the legendary Cryolophosaurus dinosaur ! Designed with great attention to detail, our dinosaurs toy is not only eye-catching but also educational, since it will help spark your child's curiosity about dinosaurs . Best gift toys for 3 year old boys and girls. 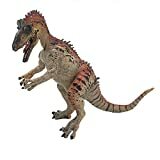 Cryolophosaurus Dinosaur Toys! - this dinosaur toy figure is just like the real dinosaur! Your child will be amazed by the Movable Jaw of our ultra-realistic dinosaur ! A fun and educational gift , Not quite sure which gift to give to your curious son or daughter? 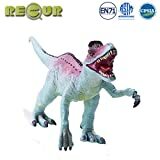 Get yourself this charming Dinosaur figurine toy to inspire and give joy to your kids, nieces, nephews or other loved ones! 2 : Lightweight and easy to carry to everywhere you want to go . 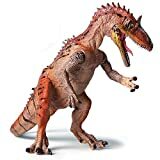 3 : This Dinosaur figures will make away your kids from electronics and let your child are imagination run wild as they create imaginary interactions with Dinosaur . 4 :Fun and educational for both boys and girls. Dinosaur toys are great for home school, as part of a science project at school, or even for taking with you on road trips or in the house !